I began my career working for the Oxford based harpsichord builder Robert Goble and Son where I worked with three generations of the family over a ﬁve year period. A growing interest in the Alexander Technique then led me to train as a teacher of the Technique. Since 1993 I have lived in Swansea, South Wales, working as an Alexander teacher. I have specialised in working with musicians and have taught at the Royal Welsh College of Music and Drama in Cardiff since 1995. I have played the recorder for many years, but in 2004 I began to have viol lessons with Lucy Robinson, then head of Post Graduate Studies at RWCMD, and of course a well known face in the viol world. At the same time my interest in instrument making was reawakened, and I began to build viols, ﬁrst for myself and my partner, and then gradually for other people. In 2007 I met Colin Mantripp of Lillyfee Arts and Crafts who taught me sculptural woodcarving. 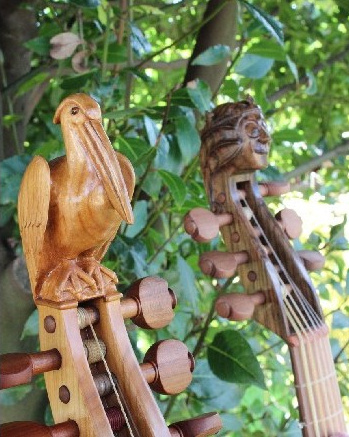 Most of my viols have heads carved by me, and Colin himself also has carved one for me. Although my viols are closely based on surviving originals, one of my main aims in building a viol to commission is to match the instrument to its future player and owner. Choice of historical model, suitable timbers, decoration, the subject of the head, if it has one, variations in varnish colour, and setup are all discussed closely at the outset. In common with many instrument makers, I do not try to make facsimiles of old instruments. My ideal is to ﬁnd a way to combine my own sense of visual and musical aesthetics with a historically accurate blueprint, and to create an instrument that is uniquely suited to the person for whom I have made it. For many years I have avoided the use of tropical hardwoods, both because of the environmental impact of the extraction of high quality timber trees from vulnerable habitats, and also because of the human cost of illegal logging which still accounts for a high proportion of tropical hardwood production. In addition to viols I also offer a unique design of carbonﬁbre viol bows, which I developed as an alternative to bows made from tropical hardwoods, and a wooden music stand.